Got out of my home-stay I was staying in and walked to Candolim beach, 500 mtrs away, and started walking south. The sea to my right and the shacks on my left. I had a camera in my hand, the sea breeze on me, sound of the waves in my ears, water lapping at my feet and the beautiful sight of the setting sun. It was the best walk ever. The walk in Goa. The sight was beautiful, kids playing with their dad and mom watching them, an old couple holding hands and walking in silence, comfortably; young couple chatting, perhaps about their wonderful future; man, around 45ish kite-surfing; dogs playfully chasing the waves. I wonder if that is paradise. 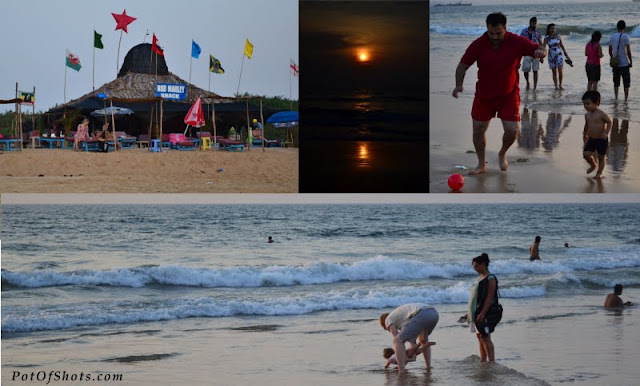 This is what differentiates Goa – tourists leave their burdens and worries at the state border. And the coastline is purely tourist turf (Esp Candolim and southwards it is not very crowded), we do not get to see a lot of local folks except for shopkeepers and hawkers. It is beautiful just to be there. This is my third time to Goa in three years and it always fascinates me, every-time there is more to receive from this beautiful place and so much to surrender to it. It is in silence that we know ourselves more! When you go to Goa, go there to be there, nothing else! another blog on travel and whole trip coming up in a while.